Automatically started once you complete Rag and Bone Man. You'll need to kill several monsters to collect their unique bones that the Odd Old Man wants. 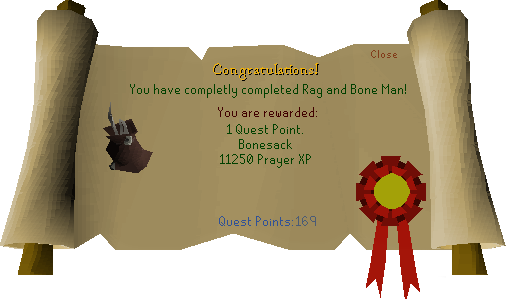 Rat (Level 1) Rat bone Found in Lumbridge Castle. Cave goblin Cave goblin skull Found in the Lumbridge Swamp caves. Seagull Seagull wing Found in by the docks of Port Sarim. Ice giant Ice giant ribs Found in Asgarnian Ice Dungeon south of Port Sarim. Mogre Mogre bone Found to the south of Port Sarim, on the penisula with Ominous fishing spots. Zombie Zombie bone Found in Edgeville Dungeon. Moss giant Moss giant bone Found in Varrock Sewers. Bat (small) Bat wing Found by the Odd Old Man. Snake Snake spine Found in Ardougne Zoo. Requires Telekinetic Grab to get bone. Wolf Wolf bone Found in Ardougne Zoo. Requires Telekinetic Grab to get bone. Ogre Ogre ribs Found in Ardougne Zoo. Requires Telekinetic Grab to get bone. Jogre Jogre bone Found north of the Gnome glider landing point. Jackal Jackal bone Found to the west of Nardah. Desert Lizard Desert Lizard bone Found to the far north of Nardah. Vulture Vulture wing Found to the south-west of Nardah, by the Agility Pyramid. Undead Cow Undead cow ribs Found north-west of Port Phasmatys, in the farmer's yard. Experiment Experiment bone Found west of Port Phasmatys in their dungeon, accessed via the statue just east of Fenkenstrain Castle. Werewolf Werewolf bone Found in Canifis. Ghoul Ghoul bone Found north-west of Canifis. Zogre Zogre bone Found in Feldip Hills, by Jiggig. Basilisk Basilisk bone Found in the Fremennik Slayer Dungeon. Rabbit Rabbit bone Found by the swaying tree to the east of Rellekka. Dagannoth Dagannoth ribs Found in the Lighthouse to the very north of the map. Fire giant Fire giant bone Found in the Baxtorian Waterfall dungeon. Terrorbird Terrorbird Wing Found in the south-west part of the maze, take the southern route from the normal entrance. Baby blue dragon Baby dragon bone Found in Taverley dungeon, south of the normal Blue dragons. Troll Troll bone Found to the east of the Trollheim teleport spot.